Bob Finnerty had the ultimate man cave in his house, and your buddy deserves to have one too! Here are some helpful hints that should aid in making your holiday shopping easier, showcasing some items that any guy would love to have for his man cave, including cool beer coasters, new games for his Xbox, and of course, his own copy of The Watch! No need for fancy china in a man cave! Get your buddy a set of recycled drinking glasses made from beer bottles. Choose your friend’s favorite brands to add a personal touch. You can buy sets of glasses at a local flea market, online sites such as etsy.com, or at select home goods stores. In a room filled with guys, the odor is bound to get a little funky. A great gag gift for any man cave is a handy air freshener. Try finding one with a clean manly scent. For any girls that make it in the cave, this gift will be much appreciated. Boys’ night in the cave doesn’t always have to revolve around the 62” screen for Monday Night Football. Get your dude friend a killer poker set for an equally enjoyable time. Before you know it, the guys won’t even need a Vegas trip. Well… not as many trips to Vegas. The guy squad from The Watch documented their crazy nights in the cave using a digital camera. A great gift idea is to purchase one of the new digital polaroid cameras or printing systems that are all the rage. This way, instant prints are a flash away, making certain that fun times will not be forgotten. There is no doubt that your buddy will use the man cave for a multitude of media: TV, music, videogames, Netflix. A great way to make it easier for him and his friends to enjoy different types of media content is to gift him with a media streamer box. There are several on the market that connect all media devices, including mobile, in an affordable way. The man cave is the perfect spot for an XBox haven. Buy your buddy new releases of their favorite games including Halo 4 (Nov. 6th), Call of Duty: Black Ops II (Nov.13th), and Hitman: Absolution (Nov. 20th). Warning: Frequency of Contact and Personal Hygiene May Decrease Tremendously! 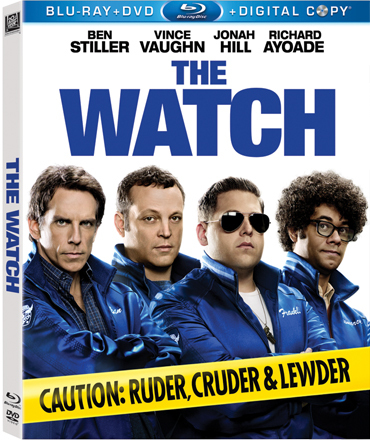 Of course the ultimate gift for your favorite dude this holiday season is a copy of The Watch on Blu-ray or DVD. This film is perfect for a group of friends to kick back in front of the big screen while enjoying a few beers. 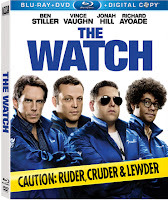 Plenty of male bonding is sure to occur while watching Evan (Ben Stiller) and the gang protect the people of Glenview, Ohio.